Untitled. Copyright 2015 Erik Stensland. Used with permission. Click for maximum size. 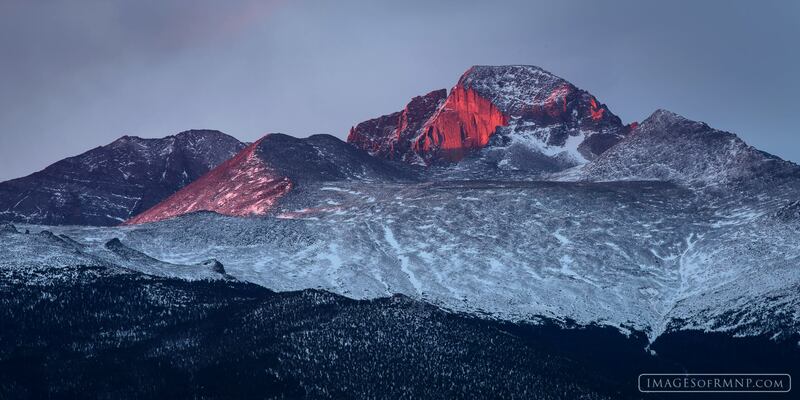 Estes Park, Colo., photographer Erik Stensland was certainly in the right place at the right time on October 29, 2015, when the rising sun illuminated the east face of Longs Peak in Rocky Mountain National Park. He estimated this light lasted about 90 seconds. It reminds me of a brilliant pink gem rising above a platinum setting. ‹ Can you find the sheep in this picture? Thank you for sharing this striking beauty. My pleasure. But Erik is the one who deserves the thanks for being out there taking his photos when the rest of us are tucked snugly in our beds. With our wonderful digital cameras, more and more of us are capturing these fleeting moments of beauty. That is magnificent. The best camera in the world wouldn’t help me. I rarely see the crack of dawn, much less from high in Rocky Mountain National Park. I’m glad someone like Erik is out there capturing such moments.